You've found the “U.S. Ancona Duck Breeders” page here at Hobby Farm Wisdom! If this is the first time you have visited our site: Welcome! The Ancona duck is a rare domestic breed originating in England. They do not migrate because they are flightless but are efficient foragers eating greens, slugs, insects and arthropods. Anconas are calm animals and serve well as pond or yard breeding birds and can lay up to 210-280 white, cream or blue eggs per year. The ducks have an oval head and a bill with green specks and medium length necks. They can weigh up to 7 or 8 lbs. 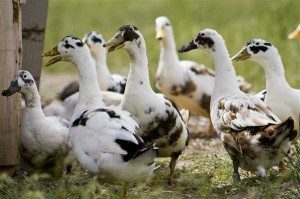 The ducklings are yellow with spots and as adults they are white with “Pinto” markings existing in a variety of colors including: Black and White, Blue and White, Chocolate and White, Silver and White, Lavender and White, and Tri-colored. Most common is black and white. Their bills and feet are orange, and may also be spotted.